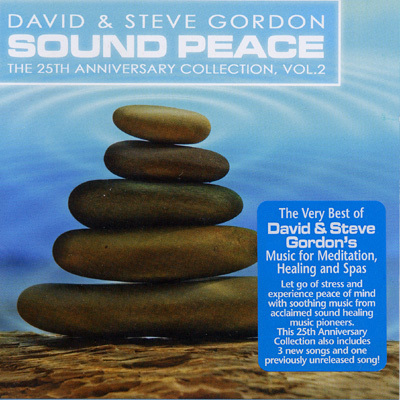 Discover how easy it can be to relax, with soothing music for meditation, relaxation and spas from legendary sound healing pioneers David & Steve Gordon. Since 1982, their serenely beautiful music featuring grand piano, acoustic guitar, harp, flutes and nature sounds have helped millions of listeners let go of stress and experience peace of mind. In addition to featuring highlights from their award wining career, this 25th Anniversary Collection also includes three new songs and one previously unreleased song. Find out what leading spas and healing arts professionals worldwide already know; the Gordon Brothers music is powerfully effective for meditation, healing, yoga, Reiki, sleep and relaxation. There is a certain quality of peace in their music that people notice as soon as they hear it. Your breathing slows, your heart relaxes and you begin to feel serene. Give yourself the rejuvenation your body, mind and spirit need with this powerfully relaxing music.